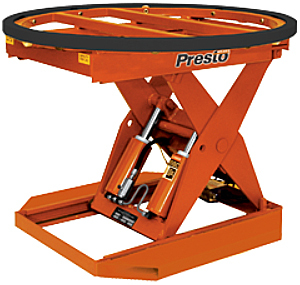 The Presto P3PH-24-40 Pallet Positioner / Pallet Rotator makes building and breaking down pallet loads simple and fast. The P3PH-24-40 features electric hydraulic lift and lower of loads weighing up to 4,000 LBS. Ideal for reducing the amount of user bending and stretching required to load / unload pallets and totes. 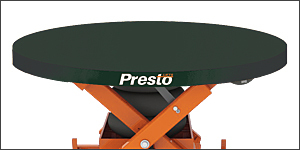 The lowered platform height is 8¾” and the maximum lift height is 32¾”. 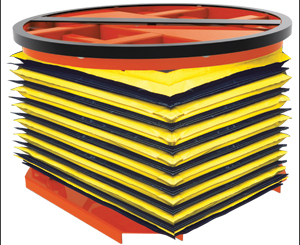 The turntable top rotates 360° eliminating the need for the operator to walk around the pallet. The Presto P3PH-24-40 electric pallet positioner can be easily moved from workstation to workstation with a forklift using its built-in fork pockets. The Presto P3PH-24-40 Pallet Positioner is built to order with an estimated lead time to leave the warehouse of 20 to 25 business days.